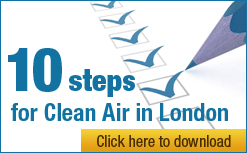 Clean Air in London, which runs the cross-party campaign of the same name, has published its manifesto for the Mayoral and London Assembly elections on 3 May 2012. “London is back where we thought it was during the Great Smog of 1952. “Boris Johnson says there were 4,267 early deaths in London in 2008 attributable to long-term exposure to ‘invisible’ air pollution (at an average of 11.5 years each). This compares to 4,075 due to short-term exposure during the ‘visible’ Great Smog of 1952 when we knew nothing of the health impact of long-term exposure to air pollution. Only smoking causes more early deaths now. “Clean Air in London is therefore calling on all the Mayoral candidates to promise in their manifestos to end the biggest public health crisis for decades. After four years of backward steps on air quality measures, Boris is well behind on this issue. “We need a Mayor who will show the world, starting with the Olympics, that London is leading the way in tackling air pollution as it did after the Great Smog of 1952. Titled ‘Manifesto for ‘clean air in London’’, the manifesto lists five themes, 12 key policy areas and 45 measures needing to taken by the Mayor and London Assembly over the next four years. Kulveer Ranger, the Mayor’s Director of Environment and Digital London, is due to give evidence on 2 February 2012 to the London Assembly Environment Committee about key environmental priorities for London over the coming years.